The Gospel singer Eric i, original writer and composer of all songs in the #Cityoffaith album which dropped last year, refused to take a bow, He is out with this amazing single titled #Youaregreat. Go get this one, only one thing will the Song do, to lead you into God’s presence and keep you there. 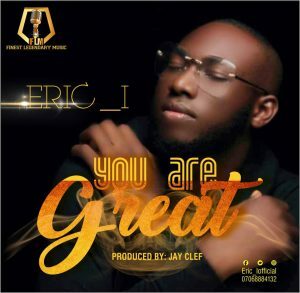 Now trending on all SOS comes YOU ARE GREAT by ERIC i, an amazing worship song, that describes God’s kindness and love John 3:16, a testimony winning song. Please download, listen and share to bless others.